when it comes to Fergus McKay & Nothing Concrete! 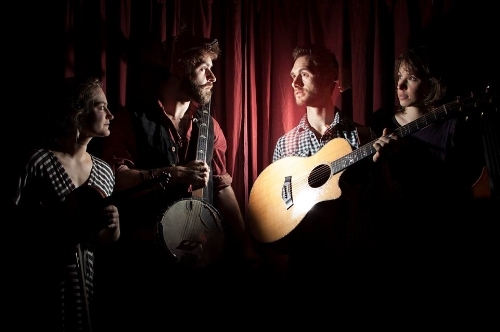 I have been speaking with Fergus from the group about their new single, Old Black Crow, and wondered where they head from here. I was keen to know how the band got together and whether, being based in the Pyrenees, there is an active music scene and source of inspiration. Fergus recommends some upcoming artists and discusses whether there are any tour dates coming up; what their live set consists; the advice he would give to artists coming through – I discover why this past week or so has been especially eventful for the band! We’re all pretty tired from a pretty intense and eventful week on the road. We left France with a great gig at a craft beer brewery then headed to Italy and Slovenia but, on the way, stopping for petrol we found we couldn’t turn the van off - even with the key out and batteries disconnected the engine kept running. It was meant to be a fourteen-hour journey but, with one thing and another, it ended up being seventeen-hour-straight without being able to cut the motor; no air conditioning, the whole band; double bass and a disable dog in an eight-seater minivan…after driving through the night, we had two gigs in Slovenia, one of which we got held up on the motorway for three hours in non-moving traffic, so arrived an hour after our sound-check. Then, we had three gigs at Floating Castle Festival in the south of Slovenia. It’s an amazing vibe there; a real melting pot of styles, cultures; World music, Classical; Rock, Jazz; abstract stuff, puppetry; poetry street shows and so on, all around a beautiful medieval castle in the forest. Leaving there, the alternator on the van gave up so we got towed off the motorway; had to find a replacement battery to get to where we are now while we wait to play at PUF festival in Koper near the sea. We’re still alive and still talking to each other, so it’s good. Well. It’s a mix of styles and influences: people have compared us to various acts like The Waterboys, Ronnie Lane (ex-Small Faces); Dexys Midnight Runners, Woody Guthrie; Bob Dylan and so on. There’s a big slice of Folk music from both sides of the Atlantic that form the basis of our songs but we try and bring in elements of World music, Swing; Jazz and Blues to create something unique and exciting with it all…then we are lucky enough to have three ladies who tap dance in the band, so we add that into the mix for good measure! What can you tell me about the new single, Old Black Crow? How did it come together? I had just read Conrad’s book, Nostromo, and I wanted to write something that captured the same kind of feeling I got from that book. It tells the story of a bunch of renegades making a getaway, but we don’t know what they did or why. I was listening to a lot to Dylan’s album, Desire, and some of my favorites of his songs take this format which isn’t the standard verse-chorus-verse-chorus, bridge; verse-chorus, but just tell a story that continues to develop. So, I decided to not write a chorus or a hook, but just let it be a story which, perhaps, makes it an odd choice for a single but we really get a good reaction to it live and we tried to give it some swing, keep it upbeat and dancy so we hope it can grab some people’s attention! Is there going to be more material coming later in the year? What are you working on? Well. Old Black Crow is the first song we are putting out from the new album, which is nearing completion, and the band has been evolving during recent months and we’re trying to get some of the newest ideas into the arrangements of the songs we’re playing in our live set. The album will be pretty eclectic, including a Swedish-style Polska (a traditional dance tune), a couple of rootsy numbers; something I wrote inspired by travelling around the Balkans and playing with different time signatures and some other surprises. The last album, Ever the Forager, had a lot of Scottish and American Folk in the blend; banjos, fiddles and mandolins. This time, I’ve been working with three saxophones, writing and arranging for baritone, tenor and alto for our live show so there’s more brass, which is leading to a slightly harder, edged and jazzier sound, which I think suits the songs that we’re putting on this album. How did Fergus McKay & Nothing Concrete find one another? You have a pretty eclectic line-up there! Well. 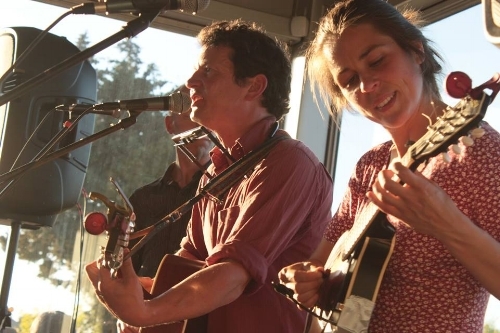 I had been travelling around Europe as a traditional one-man band, like Bert from Mary Poppins, and Gaia, who’s now my wife, and I came to a party in the South of France where I played…but we met so many cool people over one weekend we decided to stay forever! Gradually, we came across more and more people with the same or similar stories. There’s something about the region that makes people want to settle there; it’s like stepping backwards in time, out of the rat-race. It’s easier to create a simple way of life there that still fulfils all our needs. I guess it does seem like a huge coincidence that we all ended up living within a few miles of each other in the middle of nowhere and all have complementary skills and musical interests. Have to put it down to cosmic magic, I guess! 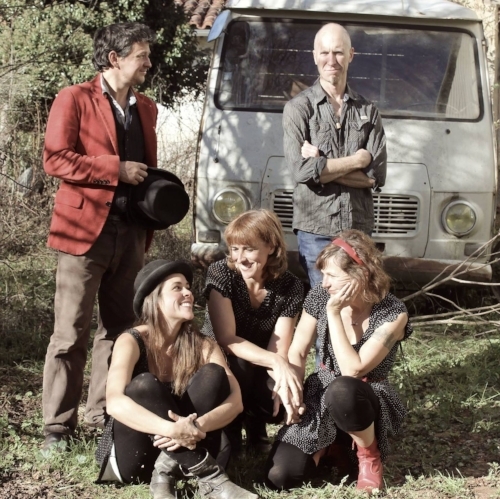 Being based in Pyrenees (Southern France); what is the music scene like there? Is it quite an ideal and quiet spot to create and play? The music scene is surprisingly vibrant; bearing in mind this is an area traditionally populated by small-scale subsistence farmers. In the last thirty years or so, more technology and farm machinery meant that lots of these kinds of areas became depopulated as kids of farm workers had to move to the cities and retrain to find work in industry instead of agriculture. But, this also meant that lots of old farmhouses and small villages were abandoned so the artists moved in and, with the artists, the artisan cafés and market stalls started to grow; then the artists learn to use the land and develop their own communities and the area became rich in a new way. So, there’s a huge mix of people and nationalities here: people from every corner of the world seem to end up settling in this little huddle of ten or twelve little picturesque villages. That creates a great environment for many things, especially music; predominantly folky, rootsy and acoustic stuff, but not only. We have a couple of really nice small festivals - and people love to go out to see live music here. Does the fact you have a few different nationalities working in the band provide the music with greater variation and flexibility, would you say? Do you find the songs take in different sounds from around the world? Definitely. This has been one of the main musical objectives for Nothing Concrete all along: to broaden my cultural horizons and learn from the people I work with and then try and bring that into the songs. In the world of Pop, Rock or other mainstream music, the sound, instrumentation and production values are fairly generic no matter where you go in the world...but the richness of musical styles when you start to look into traditional music cultures from different countries is mind-blowing. So, when you work with musicians that have these different cultural backgrounds, it’s inevitable that some of this comes out in the music. The more we travel as a band the more we learn from other musicians we meet en route, hence being in Slovenia right now. It’s a kind of gateway country between our Western European cultures and the musical traditions of the Balkans and Eastern Europe. The more musicians we get to play with from different cultures the more we realise how much there is to learn. It makes you feel like you’re constantly just at the start of an amazing musical journey. Which artists are you influenced by? Who are the musicians who have made the biggest impact on the band? Growing up, I listened to a lot of stuff my dad liked: Dylan, Tom Waits; Van Morrison, Paul Simon and, particularly, the Faces and Ronnie Lane. I still love that rough-and-ready feel; the sound of people having fun playing acoustic music together. Then, the Celtic stuff in the '80s, like Dexys Midnight Runners; The Waterboys and Hothouse Flowers were all doing the stuff I wanted to be doing. But, later I discovered a whole new world through the music from the Tony Gatlif film Latcho Drom. Watching that was a watershed moment; a must-see for anyone interested in music! We have no U.K. dates in the diary at the moment: we’re continuing to tour in Europe until October this year and we have a number of dates in France but are planning to put together some dates for 2019. Watch this space. We always announce our tour dates on our Facebook page as soon as they’re confirmed. It’s all about engaging with our public. We’re usually six on stage: three ladies, three guys. The songs are mostly upbeat with a Swing/Folk feel. Everything is very live; no technology except the P.A. system and lighting rig. We’ve brought a number of new elements into the show in recent times, including several tap dance and lindy-hop routines from the girls and, even, an appearance by Gromanich, our monster mascot! By the end, we usually aim to have everyone up on their feet dancing. I think it’s a pretty fun gig to go and see! Angie: Seeing Jeff Buckley live in a small, intimate venue. It was a life-changing moment, being around such musical passion and it made me reevaluate what was important to me. Saskia: When I was a student, I had a quite high-up studio. The weather was perfect. I could sit in the sun and a song by Funkadelic played. Perfect bliss. Gaia: My two children love a song from Boban Marković, an amazing trumpeter from Serbia. We regularly put it full volume in the house and dance like crazy. My mum and me used to do the same with quite bad Pop, Italian music and Dance in the living room whilst rolling on the floor. As for the rider...we’re pretty happy with some good, organic food (mainly vegetarian) and a beer or two - homebrew best! Play lots and lots and lots of gigs, get out there and meet other musicians and learn from them; learn to live well with minimal income! 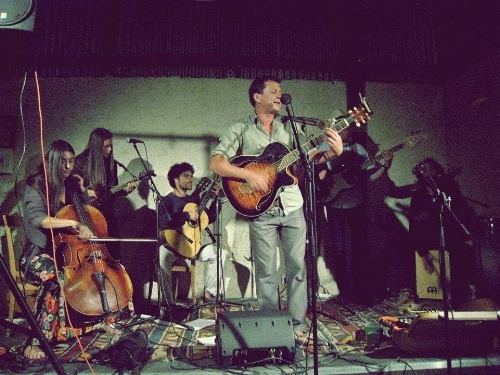 Old Salt is a mix of Americana and World music with a fairly intercultural mix of musicians. Kate in the Kettle from Scotland; Tygroo from the Czech Republic are full-on Turbo-Folk with lots of brass; loads of attitude and an amazing live show. Music is always there but, sometimes, we’re using it to unwind. Sometimes it’s work, but home life is great; just hanging out with the kids in the garden, or camping in, the Pyrenees…or just reading a book!